papaki Review 2019: Is papaki a Good Hosting? Papaki provides shared web hosting, managed WordPress hosting, and website builder plans to customers in more than 150 countries including its home country of Greece. Papaki is a subsidiary of the Enartia, a Greek company that was established in 2004. With over a decade in the hosting industry, this company has served more than 60,000 customers in 150+ countries including Bulgaria, Spain, the United States, Belgium, the Netherlands, Cyprus, and the United Kingdom. Papaki’s website is available in English and Greek. Papaki’s three shared web hosting solutions are Small (for personal websites or blogs), Medium (for hosting multiple websites and blogs), and Business (e-shops or corporate websites). The most basic Small shared hosting plan comes with 5 GB SSD disk space, 100 GB monthly bandwidth, and 5 email accounts. At the other end of the scale, the Business plan provides 15 GB SSD disk space, 600 GB monthly bandwidth, and up to 150 email accounts. All plans include daily backups with a 30-day backup history. Other premium features included in the vendor’s hosting solutions are SSH access, SFTP, custom cache, Git on Plesk, website staging in Plesk, and a free domain for life. Also, 24/7 website protection against DDoS attacks. Although Papaki’s website has a link to dedicated server solutions, this takes you off to another provider, Top.Host. It’s interesting that both providers give you a 90-day money-back guarantee. Papaki’s hosting prices are pretty standard (in euros), and the plans have few feature restrictions. You can pay for plans on terms from monthly to triennially, with discounts for multi-year commitments. You might feel better about making such a multi-year commitment when I tell you that you get an incredibly generous 90-day money-back guarantee that guards against anything going wrong during the first three months. The 99.9% server uptime guarantee is also nice to have, but it’s not quite as good because it is slightly below the industry average. For self-support, Papaki’s website includes a very well populated knowledge base. Papaki could be a good Greek host for small and medium-sized businesses. It’s standard shared hosting plans are complemented by a set of more expensive Website Builder plans. Or, to put it another way, you don’t get the website builder for free. 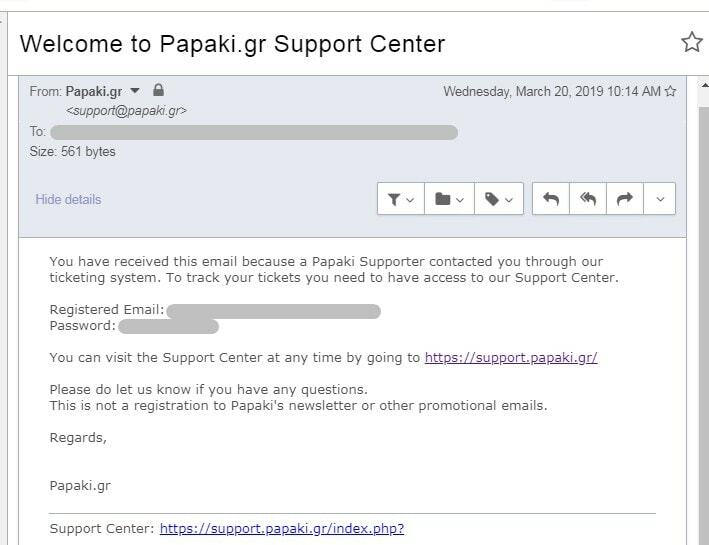 Get an amazing 90-day money-back guarantee from Greek host Papaki. Wondering how papaki stacks up against other Web Hosting companies? Enter any other Web Hosting company and we will give you a side-by-side comparison.